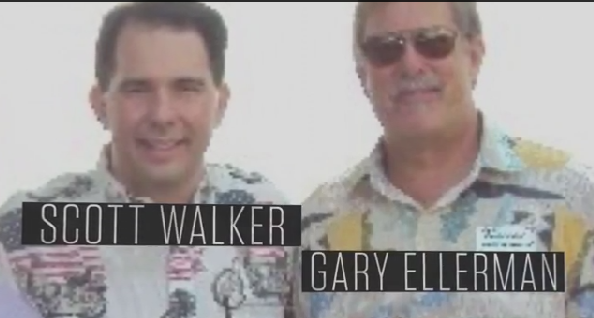 DemoCurmudgeon: Great New Burke Ad Exposes Walker's former Trek Hit Man!! Great New Burke Ad Exposes Walker's former Trek Hit Man!! The party of racist bigots gets a little sunlight in Mary Burke's new ad. While Scott Walker smirks claiming, "I know nothing," his October surprise may just secure any doubting independents...or will it? TPM: Ellerman first made the accusation that Burke was fired. The Milwaukee Journal-Sentinel notedthat Ellerman serves as chairman of the Jefferson County Republican Party and ran as a fake Democrat two years ago in order to fight a recall of Senate Majority Leader Scott Fitzgerald (R). Lest we forget, the MJS ran the statement that Ellerman was a fake Democrat and Jefferson Co. GOP chair, ONLY AFTER every other credible news organization and blogger in the state reported on it. Their hand was forced to report. So what did they do? They ran it as an op-ed and buried it in the back pages. Editors had the information to kill the story and chose to run it, knowing it would get picked up around the state. The story, GOP propaganda outlets ran lies about Mary Burke, won't qualify as news. This ad really made the rounds this weekend, and it seems this smear has indeed backfired on Walker, showing him and the GOP to be amoral slimeballs. A Daily Show looks at the Koch Brothers. Hillary Clinton still crushes "Job Creator" myth. Vader's Internet Party threat to Putin Empire? Chuck Todd comes to Madison, Wisconsin. Ed Schultz talks with Mary Burke. Lazy Right Wing thoughts about Voucher Subsidies. Immature Men "stand with Scott Walker." Republican protection racket rolling out!!! Paul Ryan's Free Market line of BS Exposed!!! The Bubble World morphing into something Real!! !